Congratulations to Heaven Evans, Class of 2018, a member of the Thomas More University women’s basketball team which has clinched the NCAA Division III national title! Heaven was a walk on to the Saints team this year, following a stellar basketball career at DePaul Cristo Rey. The Saints capped an undefeated season with the 81-67 win against Bowdoin College on March 16 in Salem, Virginia. 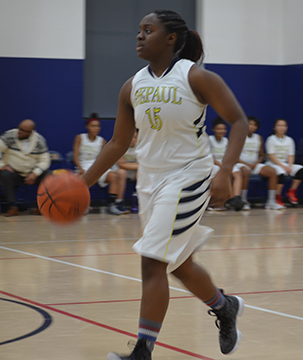 While at DePaul Cristo Rey, Heaven started on the varsity basketball team all four years and scored 1,364 points during her DPCR career while never missing a single game. In May 2018, DPCR retired her jersey – a school first.